"I used to be beautiful, but drugs did this to me." This particular interview began differently than the others I have done. Firstly, because I was in the metropolis of São Paulo, Brazil. 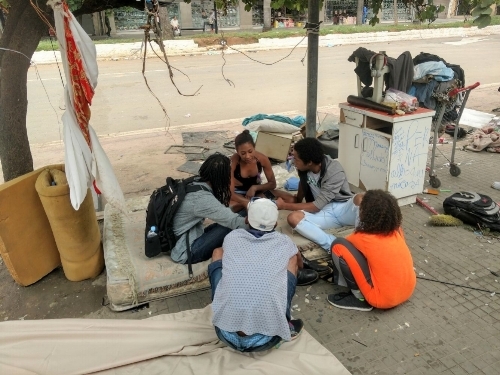 Secondly, we were outside of the Luz Station distributing bag lunches to the homeless on Avenida Duque de Caxias, a street teeming with homeless addicts. On this street, these men and women are blissfully ignored; surreally shrouded amongst congested car traffic and bustling pedestrian commuters. Bodies were strewn along the sidewalk, with an occasional puff of crack smoke escaping from underneath piles of ratty, old clothes. Wellington, our friend, partner in ministry and translator thought it would be a great idea to interview one of the homeless in his city to share their story on our website just like I do at home. He would record the entire conversation, translating questions and answers so I could have a playback to write from. I thought it was a grand idea, but we found ourselves in a place that was obviously not conducive to a relaxed and friendly open conversation. But as we began to distribute food and greet the tidal wave of grabbing hands and smiling, appreciative weather worn faces, a silent, beckoning stare demanded our attention. There she stood, asking that we take a picture of her eating the meal we provided for her and Wellington capitalizing on the occasion, asked if she would mind answering a few questions for us. She waved us over to her “space”; a ratty mattress laying close to the curb. She gently draped a blanket over the mattress, smoothing it out as if tidying up a bit as she invited us to sit with her. Although, she seemed very welcoming there was an obvious conflict from within distorting her face as she struggled to smile. As she continued to share her story, we were transfixed by the softness of her voice and her body language that made it clear she was uncomfortable allowing us into her world, but perhaps needed this time to be transparent and vulnerable. I felt honored, humbled and hopeless as her eyes would turn away from me at times in shame or right at me in avowal, or menacingly at the men who normally shared her life tried to infiltrate the privacy of our conversation. My heart broke in a million pieces as I tried in vain to absorb every moment of the conversation, painfully aware of the watchers who were plotting an opportunity to take some sort of advantage of the situation. Mayara shared that a couple of tragic events are what broke her and led her to drug use. When she was young, one of her baby twin brothers died in her arms. She did not explain how. She also shared that her daughter, who is now three and lives with her mother, almost died of heart complications. She claims her addiction to crack has not totally consumed her because it doesn’t prevent her from seeing her family. Almost unapologetically, she told us that she uses drugs, drugs don’t use her. 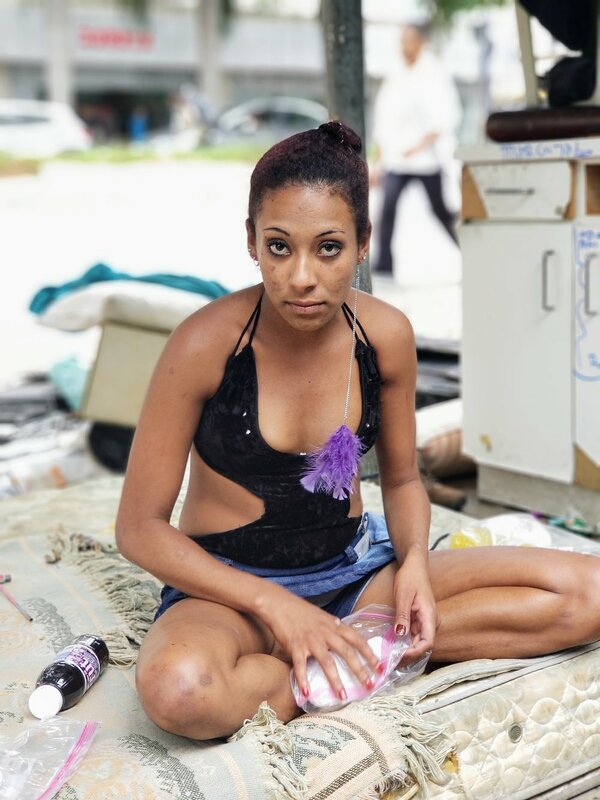 She spends her days at this spot on the street, but sleeps indoors at night in hotels, prostituting herself to support her habit. I asked her if she could have anything at all in this moment what it would be and she responded with a whisper, “my family”. My final question was if she believed in her heart that her life will ever be different and she said with full confidence, “God is going to change this situation.” She then thanked us for our time and admitted that “sometimes we just need to let it out.” I asked if I could pray for her and together we prayed a prayer of hope, faith and the promise of a brighter future. As our prayer ended with a resounding amen, Wellington’s phone that he was using to record our conversation was stripped from his hand and the culprit jumped on the handlebars of a waiting bicycle and sped off. Inside, I became undone as I watched the happiness that snuck into Mayara's smile bleed out and her troubled, defensive look instantly reappear. She scrambled to grab a couple of items that were at her side and took off running down the street after the thief. Chaos swirled around us as her fellow street neighbors suddenly came to life screamed profanities and threats furious that one of their own would violate our generosity and trust. They promised the phone would be retrieved and urged us to wait as many others took off in pursuit. The phone never came back and neither did Mayara. Please join me in praying for Mayara.